Opinion | Fighting the Buddhists with `God?s Armour? Fighting the Buddhists with `God?s Armour? Colombo, Sri Lanka -- In Sinhala there is a pithy saying that when you open your mouth to tell a lie, your tongue will come out with the truth (Kata boru kiwwath diva boru kiyanne ne). Going through some old press clippings, I was reminded of this when I read a statement by leading American Christian Evangelist Billy Graham. He was defending himself against accusations of being an anti-Semite, as reported in the New York Times of March 17, 2002. In the last paragraph of his statement he says: ?...hatred of anyone with different beliefs has no place in the human mind or heart. I urge everyone to examine themselves and renew their own hearts before God. Only the supernatural love of God through changed lives can solve the problems that we face in our world.? Isn?t that funny? The man is obviously contradicting himself. This is the mental sickness of all Christian evangelists. While ostensibly denying they are opposed to other beliefs, they cannot really consider as a religion, any faith devoid of monotheism. Hence is the craze to ?save non-Christian souls.? It was Sri Lanka'as Anglican Bishop Lakdasa De Mel who declared over five decades ago that the task of the Church would not be finished till the remaining 90 per cent of the island's population were converted to Christianity (The Revolt in the Temple). 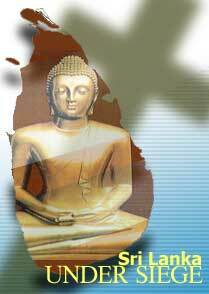 Sri Lankan-born Dhammika Akeemana, a long time U.S. resident, recalls Christian evangelists on American TV stressing the need to convert Buddhist and Hindu Asians who are ?barbarians? : because they believe ?in many gods.? This inane perception was dramatically reflected many years ago in the celebrated trial in which a young American high school teacher was tried in Dayton, Tennessee in 1925 for denying the Divine creation of man. During the trial, Defence Lawyer Clarence Darrow, an agnostic, questioned relentlessly, Chief Prosecutor William Jennings Bryan, a Christian fundamentalist. Asked Darrow: ?You have never in all your life made any attempt to find out about other peoples of the earth ? how old their civilizations are, how long they have existed on the earth ? have you?? Responded Bryan: ?No sir, I have been so well satisfied with the Christian religion that I have spent no time trying to find arguments against it. I have all the information I want to live by and die by.? Asked about the religions of Confucius and Buddha, Bryan retorted: ?I think they are very inferior? The Christian religion has satisfied me, and I have never felt it necessary to look up to some competing religion.? Small wonder that evangelists have virtually no respect for and understanding of Hinduism and Buddhism. If idiocy is the criteria of religious faith, then these Christian fundamentalists deserve the first prize. It is amusing to watch on TV the way in which Christian proselytizers in Sri Lanka try to overcome insurmountable facts of life with meaningless verbiage. Yet baloney is what makes their proselytizing a success and a danger to religious harmony in countries such as ours. Christianity has been used as a Trojan horse from the time it replaced Paganism in Europe. Provoking people who do not agree with them and then accusing those violently provoked of intolerance and fanaticism has been the evangelist strategy, since colonial times. We see plenty of evidence of it today in Sri Lanka and India. Is there any other reason for these proselytizers to open prayer houses in predominantly Buddhist and Hindu areas? In the late 19th Century, foreign Christian missionaries, hand in glove with Western powers, tried similar tactics (giving special privileges and powers to Christians) in China. When enraged Chinese peasants rose in revolt (the 1899-1901 `Boxer? uprising) and killed not only foreign missionaries but also Chinese Christians, the West promptly branded the rebels barbarians and reactionaries. But democrats and liberals like American Author Mark Twain warmly defended the `Boxers? and satirized the ?defenders of civilization? who called for a crusade against the peasants. The same proselytizing process is being repeated today in Sri Lanka and the rest of Asia at different levels in varying degrees. These evangelists are today fanning out to far corners of the globe to sell `God?. Once the? poor and the gullible are anesthetized (with material inducements) against common sense, they are then ready for `Christian surgery.? Christian fundamentalist sects trying to convert the poor by promising various perks. He believes these groups pose a bigger threat to Hindus than to Buddhists. K. Rajapuwaneswaram representing the Hindu Congress in a TV discussion revealed that Christian Evangelists in the West were converting Sri Lankan Hindu Tamils, promising them permanent residency status and/or citizenship in Europe. At the bottom of the current religious tension is the Gospel According to Matthew, known as the Great Commission, where it says: ?Therefore go and make disciples of all nations, baptizing them in the name of the Father and of the Son and of the Holy Spirit, and teaching them to obey everything I have commanded you.? Undoubtedly, the new Christian missionaries have beaten the established churches in following this command to the letter. Do we need any more examples of the conversion madness? As in Central and Eastern Europe, traditional religion in Asia is inextricably related to culture and national heritage. Several years ago, one-time Russian Presidential Candidate, General Alexander Lebed, declared that Russia did not need any more religions other than Orthodox Christianity, Judaism, Islam and Buddhism all of which had existed in that country for centuries. Christian evangelists try to justify their actions in Asia by alleging that Buddhist missionaries are doing the same thing in the West. It is a totally baseless argument primarily because of the fundamental difference between the two religions. Buddhism teaches people how to think ? NOT what to think and believe in for the sake of earthly or heavenly rewards. Members of the Buddhist clergy in the West do not pay house visits looking for possible converts. They do not claim to monopolize the truth. The bhikkus' vocation is NOT "soul saving." and providing material assistance. They do not open temples in defiance of the majority of people in a locality. Buddhist monks, whether they are from Sri Lanka, Burma Tibet, Thailand or elsewhere are all open to dialogue and discussions. His Holiness the Dalai Lama is the best example. He once a Western audience: ?Probe your inner space rather than outer space.? The problem with the West is that it has always been too outward bound. For the past several centuries it has been trying to conquer and convert the world ? ideologically, culturally and economically. Christian evangelists have formed part of this offensive. The tragedy is that all our rulers have virtually surrendered to it.